Figure. 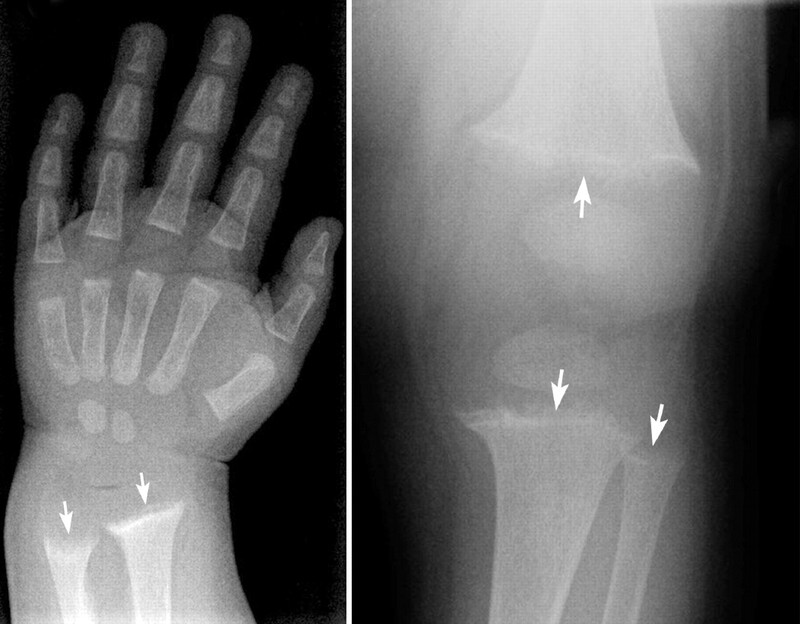 Plain radiographs of a 13-month-old boy of African descent. When enlargement of this boy's costochondral junctions was noted incidentally on a chest radiograph, additional skeletal images were ordered. They revealed widening, fraying, cupping and irregularity of the metaphyseal border of his distal radius and ulna (Fig. 1), with osteomalacia of his long bones. Fig. 1: No caption available. Findings from the child's history, his physical examination and specific laboratory tests confirmed a diagnosis of a nutritional deficiency of vitamin D. His treatment included a high dose of oral vitamin D3 and calcium gluconate until the biochemical abnormalities resolved. Radiographically, the metaphyseal abnormalities disappeared after 3 months of treatment (Appendix; available: www.cmaj.ca/cgi/content/full/174/12/1710/DC1). Rickets results from inadequate vitamin D supplementation among infants fed exclusively on breast milk. Dark-pigmented skin and the relative insufficiency of sun exposure in the Canadian climate are additional risk factors. To prevent rickets, all breast-fed infants should receive at least 400 IU of vitamin D3 daily (in northern communities, 800 IU) until they reach 1 year of age or their daily diet includes at least 400 IU (10 μg) of vitamin D from other dietary sources (Paediatr Child Health 2002; 7: 464-5, available at www.cps.ca/english/statements/II/ii02-02.htm).